It's hard to imagine what a crowd of one billion people would look like, but if one billion children stood on each other's shoulders, they would reach past the moon! 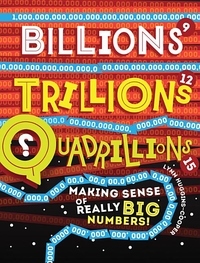 Billions, Trillions, Quadrillions explains large numbers by relating them to everyday situations. Simple explanations accompanied by amusing infographics help readers visualize large numbers and get a grip on basic math concepts. So take a journey through the world of numbers -from zero to infinity -and find out how we use numbers and how math shapes our world.